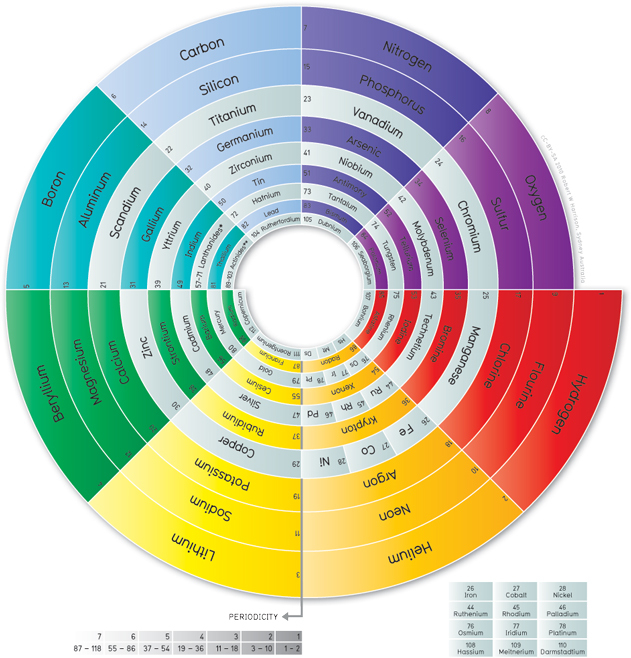 Spiral Periodic Table by Robert W Harrison is licensed under a Creative Commons Attribution-ShareAlike 3.0 Unported License. 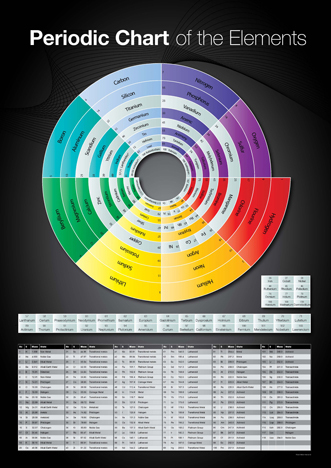 This spiral periodic chart is a new representation of the periodic table of the elements usually represented in tabular form. A representation of the periodic table inspired by The Chemical Galaxy which displays both groups and periodicity in a spiral radial format. The lighter elements are on the outer radius of the table which agrees with density wave theory of spiral galaxies where the density and rotation of matter increases towards the centre. The spiral separates the elements into the eight dominant ‘A’ groups of normal elements, and the eight corresponding ‘B’ subgroups of transitional and inner transitional elements – which have been incorporated as the inner spiral. 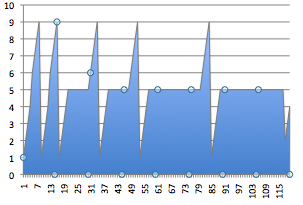 Although the spiral is dominated by the 8 main groups it also clearly highlights the periodicity of the table. The organisation of the elements closely follows H.G. Deming’s 1923 Periodic Table where A B numeration was first utilized to correspond the characteristic oxides of the ‘B’ groups to those of the ‘A’ groups. as a subgroup of Group 0 (or 18 Helium Group) which conflicts with some Modern Periodic Tables, though broadly agrees with Deming’s original proposal (VIIIA and VIIIB). Hydrogen, which generally cannot be considered as part of any group, has been placed with the Flourine group VII which appears its natural place in the spiral. This is one of the few periodic tables where common names are used. Although it is understandable that the conventional tables use symbols the design of this spiral accommodates the common names and still remains tidy and inviting to read. Element symbols are included in the expanded poster of this table. The table also reads clockwise, working inwards from the lightest and most common elements. This was necessary to for the chart to work and is another deviation from earlier attempts at a spiral arrangement of the table. The spiral is based on a very distinct mechanical pattern of eight groups which should dictate the study of the element relationships. The periodic table of the chemical elements (also periodic table of the elements or just the periodic table) is a tabular display of the chemical elements. Although precursors to this table exist, its invention is generally credited to Russian chemist Dmitri Mendeleev in 1869, who intended the table to illustrate recurring (‘periodic’) trends in the properties of the elements. The layout of the table has been refined and extended over time, as new elements have been discovered, and new theoretical models have been developed to explain chemical behavior. It has often puzzled me how we have long accepted that the chart of known elements can easily organised into ‘groups and ‘periods’ yet not continue to question the ‘process’ by which these elements became organized and why the groups have similar chemical properties. Far from being a random event or the result of a chaotic ‘Big Bang‘ the periodic table demonstrates that all matter is created from a process, evolution and predictable rules. Each stage or period in the table is governed by a new way or natural system of capturing, storing or locking-in energy. All complex pressure systems evolve ways to store energy. The laws of Thermodynamics only explain the dissipation of pressure in an open system, this is not always possible in a complex or closed system. Examples of closed system would be an atom, magnetic field, solar system, or a galaxy. Other less stable closed systems that we can relate to in every-day life would be hurricanes, plants, cells, crystals, even life itself which will predictably dissipate energy when their processes are interrupted. In the Second Law of Thermodynamics where two or more interacting systems much reach an equilibrium, entropy can be put on hold where radial dissipation involves a reduction in pressure and a subsequent increase in speed and inertia (Bernoulli’s principle) which aides the formation of closed and increasingly complex systems. A hurricane is a very good example of this. The highest speed occurs where the pressure is lowest, and the lowest speed occurs where the pressure is highest. Years ago I created a simple linear chart which organized the elements by their state. I used this to demonstrate the simple wave-like nature of matter, the repetitions of the states of matter in the periodic table. This makes the world seem a little less random. This chart clearly demonstrated in my mind that there is a process or procession of elements. How we experience any element would depend on its transitional state. So it is not a matter of ‘if’ there is a pattern but a matter of what is the pattern. When I saw Edgar Longman’s beautiful 1951 Chemical Galaxy which was displayed at the Festival of Britain Science Exhibition, I knew immediately he was onto something. The main difference in my approach was to organize the spiral inwards from lighter elements to the heavier to represent the condensing nature of matter. By dividing up the linear chart into the groups and applying this to a spiral representation, after many attempts, the above table was generated, made possible by grouping the triads into one segment. One of my favorite features of the chart, though I am not sure of the significance, is that the transitional elements can be removed without affecting the relative position of the other elements. I have a limited number of posters that i am willing to send to education facility such as a school or university for FREE. Otherwise anybody else interested I have a poster available to purchase. Contact me for the details. In the study of the periodic table and the history of change throughout the invention of the Periodic table I found your version logical and innovative. I would be interested in receiving your offer of a poster for my presentations in the CHM110 course at the University of Phoenix. Please forward future correspondence to the email listed above. I would be happy to send you a poster at no cost if it is to be used for educational purposes. Would you mind confirming your title at the university and where or in what context the poster would be used. I too would be very interested to obtain a version of your poster. I teach in a secondary school in Suffolk, England that sends a large number of students to universities such as Oxford and Cambridge. About ten years ago a co-worker and I was discussing different Periodic Chart’s and went on the Internet to find thinking this should be easy. Much to my dismay I was wrong and after a few months of searches, I finally gave up. You are probably wondering why I didn’t seek my father and get a copy. Well a few years earlier, where I grew up was a house fire, which not only consumed not only everything, but my dad was inside. I now have a wonderful son who is almost Five years of age and I would love to have enough copies, like what I had available to me, for him and I to share. I have no Idea where to look for them. Looks like someone is finally listening to Walter Russell from 1926. Russell offered this to the world but was ignored. Tesla told him to lock away many of his ideas for the next 1000 years until Humanity was ready. Hope the illustrator gives the credit where it’s due..
Great link. I have struggled through Walter Russell’s work and find it intriguing. Whether you agree or disagree with him, or just find it too difficult to comprehend, you have to be astonished by what can be mentally achieved without the constraints of convention. What I enjoyed most about his work is that it is based on the idea that ALL is one. There is only one force in the universe and everything is an expression of that one force. Very different to the approach of modern science which separates things into an every increasing body of disparate particles and forces. Walter Russell’s PT was not an inspiration for my table. I have given credit to any source of inspiration. Russell’s PT is broken up into 16 segments, mine 8. His PT starts from the inside and spirals out, mine spirals inwards representing the increasing density of movement and matter. Thanks for your interest. When designing this spiral I tried dozens of different ways organise the elements. As soon as I changed the spiral to funnelling it inwards everything snapped into place. I would like to say that the inward spiral represents the compressing nature of matter but the truth is that it does not work as well when turned about. The centre of a spiral galaxy is the most dense! They have taken the time here to notate the shell configuration. I have done a similar version of my spiral but haven’t posted it yet. It’s a very interesting graphic! The outward spiralling sort of works but it forces the designer to revert to inserting the elemental symbols instead of the names. I believe that is a loss. Your tables missing the first three octaves before Hydrogen ,only 21 elements,as in Walter russells table the only true table. a focus for the viewers to pay a visit the web page, that’s what this web site is providing. Will it replace modern periodic tabl??? ?